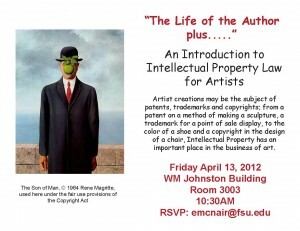 Intellectual Property experts Tom Gallagher and Eric McNair will be presenting “The Life of the Author plus…..” An Introduction to Intellectual Property Law for Artists this Friday at 10:30AM in William Johnston Building room 3003. Please circulate this to your faculty members and graduate students by passing on the attached flyer and/or directing them to the online notice at: http://info.cvatd.fsu.edu/2012/04/ip-talk/. Please request that interested parties RSVP to emcnair@fsu.edu.